Raja Casablanca has not submitted any formation. 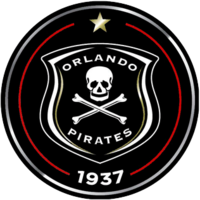 Orlando Pirates has not submitted any formation. Header by Dean Kutumela..... and the ball is in the net! Cross by Abderrazak El Fakih... into the clouds! Mark Matsi shoots... into the sky. Mark Matsi steals his opponent's ball in a tackling. Abderrazak Bounou passes the ball... and the ball is out. Mark Matsi in a tackling... and looses it! Khalid Chtibi passes the ball towards the centre... but the opponent catches it. Walid Bidane shoots... but the goalkeeper can somehow catch it. Walid Bidane runs towards his opponent and wins the tackling! Walid Bidane shoots... but the goalkeeper dives to get the ball. Paul Nyauza runs towards Walid Bidane... and looses the ball. Walid Bidane shoots... into the sky. Paul Nyauza is shown the yellow card. Walid Bidane has the ball and sees his opponent in front of him... but he can win the tackling. Header by Brahim Moutouali... that was close. Davis Clark lets taken away the ball. Daniel Mokoena passes the ball towards the centre... but the opponent catches it. Brahim Hafidi lets taken away the ball. Header by Khalid Chtibi... that was close. Patrick Zuma passes the ball... and the ball is out. Brahim Moutouali passes the ball... and the ball is out. Davis Clark tries to pass the ball to the strikers... but misses! Dean Kutumela shoots... but missed. Dean Kutumela runs towards his opponent and wins the tackling! Davis Clark passes the ball... and the ball is out. Chemseddine Khairi shoots... but missed. Mark Matsi lets taken away the ball. Omar Bidane tries to pass the ball to the strikers... but misses! Bradley Matthews tries to pass the ball to the strikers... but misses! Mohammed Amrabat runs towards Bradley Matthews... and looses the ball. Mark Matsi shootstowards the goal... and the ball is in! Omar Bidane passes the ball towards the centre... but the opponent catches it. Bradley Matthews shootstowards the goal... and the ball is in! Bradley Matthews in a tackling... and wins it! Mark Matsi passes the ball towards the centre... but the opponent catches it. Mohammed Amrabat runs towards his opponent and wins the tackling! Chemseddine Khairi runs towards Bradley Matthews... and looses the ball. Chemseddine Khairi lets taken away the ball. Chemseddine Khairi passes the ball... and the ball is out. Cross by Bradley Matthews... into the clouds! Header by Mark Matsi..... and the ball is in the net! Mark Matsi in a tackling... and wins it! Mark Matsi shoots... but the goalkeeper dives to get the ball. Mark Matsi runs towards his opponent and wins the tackling! Mark Matsi has the ball and sees his opponent in front of him... but he can win the tackling. Chemseddine Khairi passes the ball towards the centre... but the opponent catches it. Header by Ed Taylor... that was close. Khalid Chtibi has the ball and sees his opponent in front of him... and looses the tackling. Davis Clark steals his opponent's ball in a tackling. Abderrazak El Fakih passes the ball towards the centre... but the opponent catches it. Dean Kutumela tries to pass the ball to the strikers... but misses! Ed Taylor tries to pass the ball to the strikers... but misses! Cross by Brahim Moutouali... into the clouds! Ismail Belhanda in a tackling... and looses it! Ismail Belhanda tries to pass the ball to the strikers... but misses! Paul Nyauza passes the ball... and the ball is out. Brahim Hafidi has the ball and sees his opponent in front of him... and looses the tackling. Walid Bidane tries it with a strong shoot... but missed. Paul Nyauza tries to pass the ball to the strikers... but misses! Paul Nyauza in a tackling... and wins it! Paul Nyauza runs towards his opponent and wins the tackling!